Patrick Botz, founder of Botz and Associates and former Lead Security Architect at IBM, recently published a White Paper in conjunction with Townsend Security discussing dual control, split knowledge, and separation of duties--three critical controls needed to protect encryption keys and encrypted data on the IBM i platform. These controls are considered “best practices” in the IT industry, and it is common knowledge amongst security professionals that without these controls in place, any organization could be at risk for a major data breach. Just like financial controls that are put in place to prevent fraud in a business, these concepts are used in IT security to prevent data loss. As data breaches are reported in the news almost every day, we can easily see the consequences of data loss: public scrutiny, hefty fines, lost business, and litigation are just a few of the ramifications. Implementing these controls reduces the potential for fraud or malfeasance caused by the mishandling of data or a data loss event due to hackers, employee mistakes, or stolen or lost hardware. In this white paper Patrick Botz outlines the importance of these three controls and explains why they must be used to protect data stored in IBM i databases. Botz discusses on-board master key capabilities provided by the IBM Cryptographic Services APIs on an IBM i, the limitations of the IBM i Master Key Facility, and why organizations should use third-party key management to protect their sensitive data. Separation of Duties - This is widely known control set in place to prevent fraud and other mishandling of information. Separation of duties means that different people control different procedures so that no one person controls multiple procedures. When it comes to encryption key management, the person the person who manages encryption keys should not be the same person who has access to the encrypted data. Split Knowledge - Split knowledge prevents any one person from knowing the complete value of an encryption key or passcode. Two or more people should know parts of the value, and all must be present to create or re-create the encryption key or passcode. While split knowledge is not needed to create data encryption keys on the IBM i, it is needed for the generation of master keys which are needed to protect data encryption keys. Any encryption keys that are accessed or handled in the clear in any way should be protected using split knowledge. The three core controls should always be used when storing or transferring encrypted sensitive data. A certified, hardened security module (HSM) designed to secure data encryption keys and key, or master, encryption keys should implement these controls into the administration of the key manager. NIST FIPS 140-2 validation is an important certification to look for in an encryption key manager. This certification ensures that your key manager has been tested against government standards and will stand up to scrutiny in the event of a breach. With the release of IBM i V7R1, users can now encrypt data automatically with no application changes. This is great news for IBM i users since encryption has been a difficult task in the past, needing specialized encryption solutions for earlier versions of IBM i. Protecting your encryption keys in a an external key management HSM is the critical next step to protecting your encrypted data. To learn more about encryption key management for the IBM i download the full White Paper “Encryption Key Management for IBM i - Sources of Audit Failures,” by IBM i security experts Patrick Botz and Patrick Townsend. Payment Card Industry - Data Security Standards (PCI-DSS) require you to encrypt credit card account numbers stored in your database and ensure data stays secure when transferred outside your company. Dual Control means that no one person alone should be able to manage your encryption keys. Creating, distributing, and defining access controls should require at least two individuals working together to accomplish the task. Separation of Duties means that different people should control different aspects of your data protection strategy. This is the old adage “don’t put your eggs in one basket”. The person who creates and manages the keys should not have access to the data they protect. And, the person with access to protected data, should not be able to manage encryption keys. Advanced Encryption Standard (AES) has been adopted as a format standard (FIPS -197) by the US government and many state and local agencies when it comes to encrypting data in a database. AES is the recommended encryption method for PCI-DSS, HIPAA/HITECH, GLBA/FFIEC and individual state privacy regulations. Encryption methods approved and certified by the National Institute of Standards and Technology (NIST) provide assurance that your data is secured to the highest standards. PGP encryption is the standard when it comes to encrypting files that need to be transferred. Pretty Good Privacy (PGP) is the standard for encrypted file exchange among the world’s largest retail, finance, medical, industrial, and services companies. Also know that when encrypting a file with PGP, you may be using AES encryption. Transmit sensitive files over the internet using trusted encryption technologies. (AES, SSH, SSL, and PGP). Encryption solutions work together to ensure that all your sensitive data is secure even after the transmission is complete. AES will protect data at rest within your organization and PGP keeps it secure when it is sent outside your company. Protect your encryption keys and your data by keeping them apart! In a public cloud environment, one Customer’s data is typically stored with data belonging to multiple other Customers. This makes a public cloud an attractive target for attackers, as the potential gain may be greater than that to be attained from attacking a number of organizations individually. Strong data-level encryption should be enforced on all sensitive or potentially sensitive data stored in a public cloud. Because compromise of a Provider could result in unauthorized access to multiple data stores, it is recommended that cryptographic keys used to encrypt/decrypt sensitive data be stored and managed independently from the cloud service where the data is located. The most important part of a data encryption strategy is the protection of the encryption keys you use. Encryption keys safeguard your encrypted data and represent the keys to the kingdom. If someone has access to your keys, they have access to your encrypted data. Download the whitepaper Meet the Challenges of PCI Compliance and learn more about protecting sensitive data to meet PCI compliance requirements. At Townsend Security, we ensure our customers data is secured to the highest level for compliance. Our AES encryption solutions are NIST validated and our encryption key management solutions are FIPS 140-2 certified. Our HSM appliances integrate seamlessly with Windows, Linux, UNIX, IBM Power Systems and Microsoft SQL Server 2008/2012 (enterprise edition) and can also work with earlier/non-enterprise editions of SQL Server. The way organizations are managing encryption keys is falling under more scrutiny by Payment Card Industry (PCI) Qualified Security Assessor (QSA) auditors. Companies must demonstrate they are enforcing dual control and separation of duties in order to protect sensitive data. Is it still effective to use an integrated key management solution that stores encryption keys in the same partition as the encrypted data? The short and simple answer is No. There are many reasons why storing an encryption key on the same server that contains protected data is not advisable. This is not just an IBM i issue - it spans all of the current major operating systems. Let's explore this a bit more in the following sections. How do IBM i users manage encryption keys according to PCI requirements with an encryption key manager? Dual Control means that at least two people should be required to authenticate before performing critical key management tasks. Separation of Duties means that the individuals managing encryption keys should not have access to protected data such as credit cards, and those that have access to protected data should not have the authority to manage encryption keys. How are the “dual control” and “separation of duties” requirements achieved on IBM i? On the IBM i you simply can't achieve these PCI requirements if you store the encryption key in the same partition as the protected data. The QSECOFR user profile (and any user profile with *ALLOBJ authority) will always have complete access to every asset on the system. An *ALLOBJ user can circumvent controls by changing another user's password, replacing master keys and key encryption keys, changing and/or deleting system logs, managing validation lists, and directly accessing database files that contain encrypted data. From the perspective of PCI, an integrated key management system puts too much control into the hands of any one single individual. The only way to comply with PCI requirements for key management is to store the encryption keys off of the IBM i. Take users with *ALLOBJ authority out of the picture completely. When you use a separate appliance to manage encryption keys you can grant a user access to the protected data on the IBM i and deny that same user access to the key manager. Now you have enforced separation of duties. And with the right key management appliance you can require TWO users to authenticate before keys can be managed, and have dual control of encryption keys. Now it’s time to ask yourself a few questions! Is your organization encrypting data on IBM i? If so, how are you managing the encryption keys? If you store the keys on a separate partition, have you had a recent PCI audit? What did your auditor say? 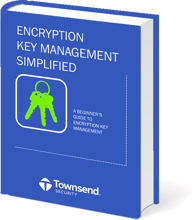 If you aren’t sure of the answers, or if this still seems foreign to you, take a few minutes to download our eBook "Encryption Key Management Simplified”. As always, we welcome your comments and suggestions! Let us know what you think of the eBook! Download our Encryption Key Management and PCI DSS 2.0 Compliance Matrix white paper and learn more about ensuring the data you are protecting meets PCI compliance. There are are a few major components of PCI-DSS that need to be addressed when implementing an external key manager into your data encryption equation. Separation of duties for starters, simply states that those who have access to the sensitive data, such as card holder details or credit card numbers cannot also have access to the encryption keys that protect them. Conversely, the same can be said for the individuals that are responsible for managing data encryption keys -- they should not have access to the sensitive data for which the keys they are creating are used to protect. Quite simply, separation of duties is the concept of dividing critical data protection processes between different individuals. This helps reduce the opportunity and likelihood of fraud when processing sensitive data. I often talk with companies who've until recently considered encryption key management as an afterthought to their security infrastructure. Often times they would store encryption keys on USB sticks or locally, alongside the encrypted data. This approach allows individuals within the organization access to both the keys and data, directly conflicting separation of duties. Utilizing an external encryption key manager to house your encryption keys, as well as implementing a policy where your security team are the only ones managing those keys and your DBA's and users are the only individuals accessing the data, will help move you in the direction of PCI compliance. But of course there are other pieces to PCI that one should be aware of when it comes to proper encryption key management. While separation of duties is good practice, there is an additional level of security that can be implemented on the encryption key management side called dual control. Dual control is a process that requires the involvement of two or more individuals to complete a specified task, such as creating a key, changing its attributes, revoking status, or destroying an encryption from use forever. Think of dual control as the act of requiring two individuals with two different keys to unlock the launch codes for a nuclear missile. You certainly wouldn’t want all that responsibility resting on the shoulders of just one person with no oversight in place. The same can be said for the management of your encryption keys. To implement dual control on Alliance Key Manager (AKM), our encryption key management HSM, you'd first active it in the AKM configuration file of the hardware appliance. Then the two Security Admins responsible for key management would install our Java based admin console into their work environments and configure them to communicate with the key manager over a secure TLS connection. Once this is established, the first Security Admin would authenticate to the key server and set an 'Authorized Administrator' time period. This allows the the first Admin to specify a window of time (in minutes) where the other Admin can log onto the key manager and perform their duties. Taking this approach to key creation and management adds that additional layer of security to your encryption key environment. In Part II of 'Meeting PCI-DSS Requirements for Key Management' I will discuss the importance of capturing your audit logs and transporting them to a collection server off the key manager device as well as dig into the concept of split knowledge and how AKM meets that requirement. 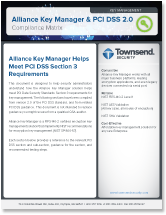 Until then, download our white paper on encryption key management requirements for PCI.